People need to more than halve their intake of added sugar to tackle the obesity crisis, according to scientific advice for the government in England. A draft report by the Scientific Advisory Committee on Nutrition (SACN) says sugar added to food or naturally present in fruit juice and honey should account for 5% of energy intake. Many fail to meet the old 10% target. The sugar industry said "demonising one ingredient" would not "solve the obesity epidemic". The body reviewed 600 scientific studies on the evidence of carbohydrates - including sugar - on health to develop the new recommendations. One 330ml can of fizzy pop would take a typical adult up to the proposed 5% daily allowance, without factoring in sugar from any other source. Prof Ian MacDonald, chairman of the SACN working group on carbohydrates, said: "The evidence that we have analysed shows quite clearly that high free sugars intake in adults is associated with increased energy intake and obesity. "There is also an association between sugar-sweetened beverages and type-2 diabetes. "In children there is clear demonstration that sugar-sweetened beverages are associated with obesity. "By reducing it to 5% you would reduce the risk of all of those things, the challenge will be to get there." The target of 5% of energy intake from free sugars amounts to 25g for women (five to six teaspoons) and 35g (seven to eight teaspoons) for men, based on the average diet. Public Health England will now reconsider its recommendations on fruit juice and smoothies in its five-a-day campaign. The current advice from the NHS is that juice counts as a maximum of one portion a day, while a smoothie may count as more than one portion, depending on how it is made. It will also investigate measures to protect children from food advertising while online and whether a sugar tax would have any merit. Dr Alison Tedstone, the chief nutritionist at Public Health England, said: "We are very concerned around sugar intakes in England. "It doesn't mean having a completely different diet from today, it is thinking about swapping high sugar foods for a lower sugar alternative. "Instead of fizzy drink, have water or low-fat milk, instead of a chocolate bar, have a piece of fruit." There's something noticeably missing from a call to halve added sugar - how would you go about doing it? This group was set up to assess the science and determine what we should be eating. Its role was not to come up with policies. The target of 5% is a huge challenge when teenagers are currently getting 15% of their calories from added sugar. One option that doctors have called for is a tax on sugary drinks. The measure is being tried in Mexico, although there is still little evidence on its impact. The tough decisions are all still to come - what measures will the public accept and how can we be encouraged to eat less sugar without driving us back into the arms of saturated fat and salt? The SACN advice echoes an announcement by the World Health Organization in March. Its draft guidelines reiterated that sugars should constitute no more than 10% of energy intake and that people and governments should be aiming for 5%. The limits would apply to all sugars added to food, as well as sugar naturally present in honey, syrups, fruit juices and fruit concentrates. The Food and Drink Federation, which represents manufacturers, said: "SACN's comprehensive analysis of the evidence on carbohydrates has looked at the role of carbohydrates, including sugars and fibre in the diet. We will look at the content of the report and its recommendations over the next few weeks with the intention of engaging in the consultation process and related discussions." Dr Julian Cooper, head of food science at AB Sugar, said targeting sugar was not a "silver bullet" and people should balance their calorie intake against how much they exercise. 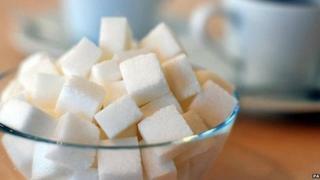 The campaign group, Action on Sugar, said the development was "fantastic" news. The group's chairman Prof Graham MacGregor argued: "Health Secretary Jeremy Hunt must start by setting targets for reducing sugar in soft drinks this summer and move responsibility for nutrition to an independent body such as the Food Standards Agency so that the soft drinks and food industry are given a level playing field, with the threat of regulation to ensure the whole of the food industry comply. "Before another million British kids become obese." Public Health Minister for England, Jane Ellison, said: "We know eating too much sugar can have a significant impact on health, and this draft advice confirms that. "We want to help people make healthier choices and get the nation into healthy habits for life. This report will inform the important debate taking place about sugar."